A contemporary designed house enjoying some of the best views on the Waiheke including the Hauraki Gulf and nearby vineyards. There are two wings to the house which can sleep a total of 16 people, and a large lawn suitable for holding marquee weddings for up to 120 people, including two large wrap around decks, outside fireplace, a stunning new pool and spa. The uninterrupted views from every room of the house are simply stunning, adding to the reason why Oneroa Bay Vineyard Estate is one of the best trophy properties on Waiheke Island. The venue has 4 different areas where your special day can transition from ceremony to relaxed canapés overlooking the bay and onto the reception in a luxury marquee decorated to your tailor made requirements. Pricing – $19,000 includes 2 night’s accommodation + wedding + wedding planner on the day package (includes GST). Waiheke Island is often referred to as the Hamptons of the Southern Hemisphere and Oneroa Bay Vineyards is certainly this. Close to all the vineyards and restaurants, overlooking the fantastic Oneroa Bay, this stunning home has the relaxed beach side character you can only dream about. Winding up the driveway through the vineyards, your reach the top of the hill where everywhere you look another magnificent view awaits you. This venue has a seamless transition from the ceremony on the lawn; to the celebrations, canapés and drinks on the front deck or around the pool; onto the reception in a marquee to dance the night away all whilst overlooking the bay by day and the twinkling lights of the boats at night. 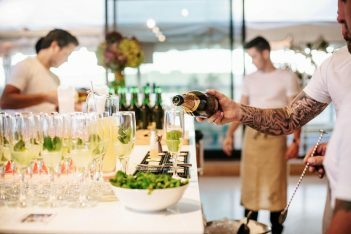 Stylish and sophisticated, this venue give you the chance to have a wedding and spend time with family and friends all in one place, leaving only to enjoy more of the fantastic sights of Waiheke.